When you’re not in the mood for a $10 deal at the pub and want to sink your teeth into some juicy, juicy beef, where do you head? We’re fortunate enough to live within arm’s reach of both coastal and hinterland stomping grounds, making for some of the most mouth-watering, local produce we’ve ever smacked our lips at. Drool-inducing, succulent and damn tasty, this is your guide to finding the best steaks on the Gold Coast. Beef, booze and banter. Home to some of the best steaks on the Gold Coast, Harry’s doesn’t disappoint. Did we mention they also dish out unlimited fries with their beef? Harry’s farm is a short three kilometres from Burleigh Heads and sprouts accompanying salads and veg, while grass-fed beef is delivered from hand-selected pastures. If you’re serious about steaks, get serious at Harry’s and taste your way around their entire menu. With 51 awards under their belt, it’s safe to say Moo Moo’s is pretty knowledgeable in the beef department. Cooked over coal and wood, there’s no shortage of interesting and indulgent steak dishes at here. As well as T-Bones and tomahawks, these steak experts dish out Wagyu striploins and rump caps too. Be sure to check out their specialty steaks like in-house dry aged Black Angus and marbled selections well worth raising your fork to. Smack bang in the middle of Mermaid Beach, Glenelg is the epitome of world-class steak. Sizzling and flipping some of the best steak dishes on the Gold Coast, did you really think we could leave Glenelg Public House off the list? Head Chef, Aaron Smith has a ‘paddock to plate’ approach to their beefy delights. This means each individual cut is power-packed with flavour and cooked just the way you like it. We’re big fans of the 200g hanger from Glen Innes, where cattle are grain fed for 270 days before making it to your plate. But if you’re feeling fancy, opt for the 250g Rib Fillet from Macquarie Downs, grain fed for 600 days. If you’re looking for the best steak on the Gold Coast, these guys are a huge contender. 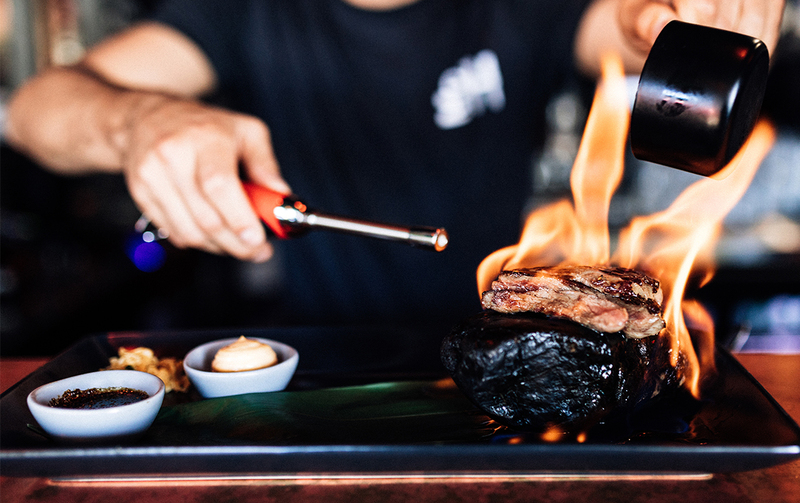 Home to some of the swankiest steaks on the Gold Coast, this swanky steakhouse snuggles into the marina giving you a front-row seat to Sanctuary Cove’s idyllic locale. Mouth-watering steaks come served on hot rocks or straight from the char grill. 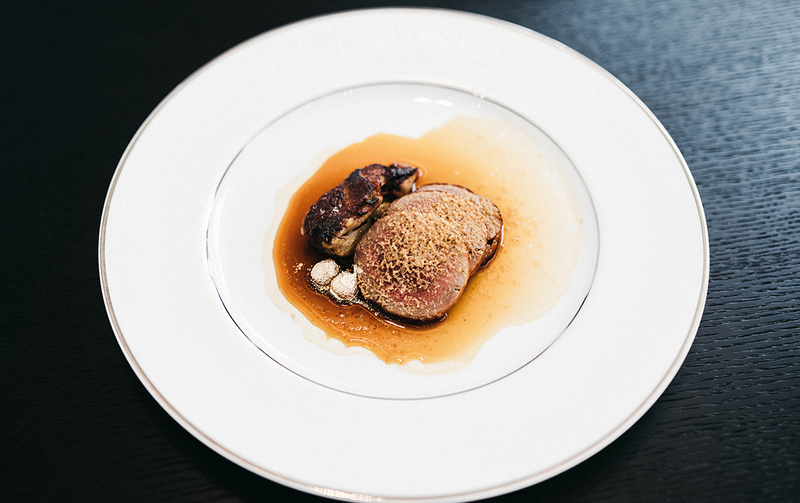 If that isn’t enough to elicit an impressed nod to the chefs, we don’t know what is. They’ve got an impressive nine steaks to sink your teeth including Angus sirloins, rib eyes and Wagyu rump cap to name a few. Take your beef to the next level by topping it with scallops or a Moreton Bay bug tail. Not just a pretty face, Nineteen at The Star has well and truly earned their stripes on the foodie scene with an extensive high-class menu. And we have to give a huge shout out to the stunning views. If we’re rounding up the best steaks on the Gold Coast, Nineteen’s 400g highly marbled Wagyu sirloin ‘Kiwami’ steak for two, is a must. We guarantee it will literally melt in your mouth. Our tip? Order the fifty-fifty mash potato on the side for the creamiest mash you’ve ever tasted. Warning, the Kiwami is probably more of a special occasion dish, as it will set you back a tidy $240. Northerners are seriously in love with Gotham’s New York-styled eatery meets high-end wine bar and for good reason, the food is excellent. If you can pull yourself away from entrees like beef carpaccio with truffle mayonnaise, head straight to the grill paddock where you’ll find high-quality porterhouse, hanging tenders and eye fillets from the likes of New Zealand, the Western slopes of NSW and right here on our home turf. 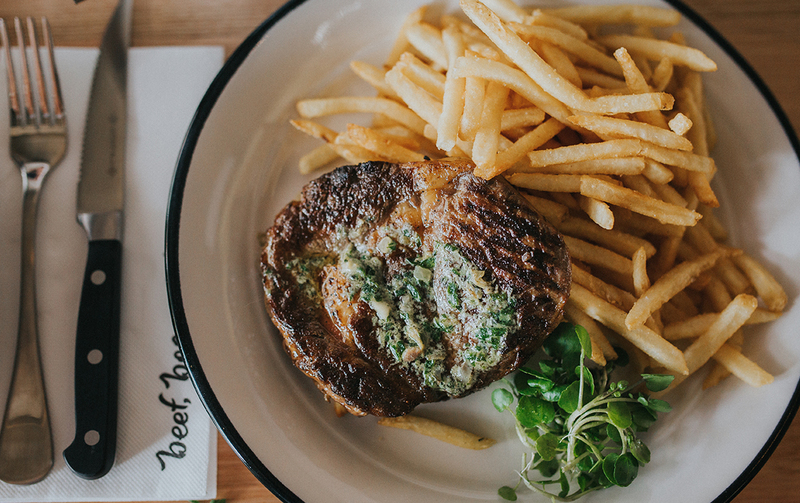 And if you feel like treating yourself, lock horns with Gotham’s 300g scotch steak sourced from Byron Bay for a mighty $129. While you might initially head to Steampunk for OTT cocktails and divey vibes, their chefs also take steak very seriously. There’s the drool-worthy 250g eye fillet rested on a bed of chat potatoes. And if you’re looking for something cheap but still oh so tasty, opt for the 350g scotch fillet topped with garlic butter and pan jus. Using local produce in each of their dishes, steak lovers will want to add Steampunk to their hit list. As well as transporting you to the back alleys of Hong Kong, Mr Hizola’s turns up the heat on their steak dishes too. Enter, the sizzling Wagyu steak. This beauty is served on a fo zek stone, delivered to your table, doused in brandy and set alight. Watch your feast cooked to absolute perfection right before your very eyes—the smell alone will have you drooling. It’s like dinner and a show for the price of one. The Southport Sharks are your go-to for delish yet affordable steaks in a pub setting. Hidden inside you’ll find Carmody’s, award-winning, steak sizzling, perfection. Known for their selection of high-quality beef treats, the restaurant offers only the finest cuts sourced from local producers like Fig Tree Organic Farm, Paul Graham’s Organic Farm and Sunforest Organic Farm to name a few. Our tip? Opt for wine pairings to match your succulent Wagyu beef rump, certified organic beef bib fillet or beef filet mignon wrapped in applewood bacon. Still hungry? Check out our round up of the best pho on the Gold Coast.